What materials and markets are most important for commercial insulation? Demand for insulation in the commercial building market is forecast to increase annually through 2022. Foamed plastic and fiberglass dominate the commercial insulation market, while all other insulation materials hold comparatively small market shares. Through 2022, foamed plastic and fiberglass insulation will continue to lead the commercial market. However, foamed plastics are expected to lose market share to fiberglass materials through 2022, due in part to the healthy growth prospects for fiberglass insulation use in the office, institutional, and industrial building segments. What regions are covered in this market research report? The Northeast, Midwest, South, and West regions are all covered in this study. Rising manufacturing activity in the Midwest will result in insulation being specified to both minimize energy consumption and ensure that plants retain their cost competitiveness relative to the South and West. In addition to being the fastest growing regional market, the South will remain the largest commercial insulation market in 2022. This study analyzes US demand for insulation products used principally for their thermal performance in commercialbuildings by material, building type, project type, and region. Materials are also broken out by product form for fiberglass (batts and blankets, rigid boards, and loose fill) and, for foamed plastics, by type of resin (rigid urethanes and polystyrene). Project types include both new construction and retrofit. 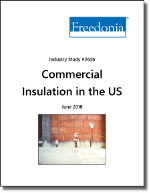 Information and data on commercial insulation were obtained from numerous primary and secondary sources, including industry participants, government agencies, trade associations, online databases, company annual reports and investor presentations, and other Freedonia Group studies. Once overall insulation demand was calculated, estimates were developed for each building type based on the intensity of insulation use in each segment. Demand estimates for specific materials were estimated based on available industry data and primary interviews with industry experts. Market share estimates were developed using sales data published in company annual reports, 10-K filings, investor presentations, trade articles, and internal estimates based on primary interviews with industry experts. Sources used include primary information via consultations with personnel of participating companies and industry specialists. Secondary data and background information were derived from numerous trade publications, including InsulationOutlook and Walls & Ceilings. More detailed information about the methodology employed in the Commercial Insulation Study is available upon request. How Will the Economy Impact Demand for Commercial Insulation? The US economic expansion reached its eighth year in 2017, with real GDP growth accelerating from the prior year’s pace. Nonresidential fixed investment will accelerate, spurred in part by a more favorable tax regime following the enactment of the Jobs and Tax Act of 2017. Creation of intellectual property and expenditures on information processing equipment are expected to achieve above average growth. Personal consumption and residential fixed investment will decelerate from their respective 2012-2017 paces. Thermal insulation is used to retard the transfer of heat from one side of the insulating material to the other. In building construction applications, this ability means that less energy is needed to keep a structure warm in winter or cool in summer. In industrial applications, insulation allows materials to pass through pipes without significant changes in temperature. R-values are a commonly used measure of an insulating material’s resistance to heat transfer. The number of US households is projected to reach 132 million by 2022 on annual growth of 0.9%, reducing the average size of a household to 2.55 persons. In the forecast years, a reversion to pre-recession trends in household formation will reduce the average number of persons per household once again. Transportation buildings will offer growth prospects slightly above average, benefiting from infrastructure initiatives. Airport and port renovations will support building construction for associated facilities. Office construction will benefit from general economic growth, but gains will be substantially slower than during the 2012-2017 period, when the segment was recovering from the aftermath of the Great Recession. What is the fastest growing material in the commercial insulation market? How will eco-friendly technologies change the future of the commercial insulation industry? Where are the best regional opportunities in the commercial insulation market?